When I tell teacher-librarians and other educators that I fit makerspace centers and activities into a fixed library schedule, I sometimes get incredulous or skeptical looks. So I thought I’d give some background and a sneak peek at a typical library class at my school. Here’s what the average 40-minute library class looks like for 3rd, 4th, and 5th grade (and maybe 2nd grade in the future). Students drop off books in the book return bin and sit at a table in the library. Two students pass out the center tracking booklets to their classmates as I review the center choices for today, and introduce a new center if needed. I try not to introduce more than 1 center per week/cycle. If it’s a makerspace center with a tool like littleBits™ or paper circuits, I demonstrate it quickly…no more than 5 minutes, then refer students to the library website resources for further help. Before dismissing students to check out, I use Flippity’s Random Name Picker tool to have students pick their center by placing their center booklet at their chosen “spot.” Doing this prevents students rushing through or skipping book exchange to get to a center they want. Students check out new books or at least scan their card before choosing a center. I do have a part-time assistant who helps with circulation, but if she’s not here, then I’m at the desk running the computer. I started the school year with ALL research centers. Once students earned their “Research Skills” badge by completing 6 research centers correctly, they had free-choice to choose any “Research Skills,” “Makerspace,” or “Reading & Language” centers for the rest of the year. These 6 completed research centers are in addition to other research projects that I teach in collaboration with their classroom teacher. As students work at their centers, I circulate the room to stamp their center tracking booklets and remind students to “check in.” For research centers students only get a stamp if they get a correct answer AND have their resources cited correctly. If I don’t have time to check answers on the fly, I still have their check-ins on Google Forms to verify what center they chose, and their answer slips/research packets to check later. Near the end of class, I start playing music to signal students to find a good stopping place and clean up their center space (I’m partial to swing/big band music). If they are still working on a makerspace project, they can save it for next time, usually in a zip-top bag. For research centers, they usually have a slip of paper or a packet that will fit inside their center tracking booklet to save for next time. I’m working on an updated center booklet that includes pages for working on research questions and projects so that they can be submitted through Google Classroom…but that’s another blog post. I don’t count this as part of the 40 minutes, but after class or after school, I usually go through all of the “check in” responses on the Google Form and I keep a spreadsheet of where each student went each week. This takes about 10 minutes per class, so about 30 minutes of “grading” a day for all three grade levels. Sometimes I can even squeeze 2 classes of grading into my planning or lunch time. Tracking student learning keeps students accountable, and if they don’t “check in,” I choose their center the following week (communicated via a post-it note on their center booklet). For more information about my library centers tracking, QR code “check in,” and the center menu booklets I use, check out this blog post! 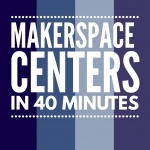 If you have any tips to share about having a makerspace on a fixed schedule, I’d love to hear them in the comments! Have a great week! How often do the students visit the library? Once a week?? Thank you for sharing how you accomplish so much in one class period! Hi Cathy and thanks for the question! Students visit once every 6 school days. We have a rotating 6-day cycle. The Question of the Week center is from Mrs. Lodge’s Library, and I use Elementary Library Mama’s Encyclopedia Task Cards with that center too. The last research center I offer is an Independent Research Center with the option of adding suggested research topics related to a theme or school read-aloud. I don’t have that posted to my store yet. My students can visit any combination of the above centers to complete 6 research activities with citations. Thank you so much for your speedy reply! I am trying to maximize my time with the kids and give them some choices too. I was really curious how you did your research center(s). This is very helpful and I will be following you for sure!! Have a great day! You’re very welcome, and I’m glad I could help you! Happy making!